Last of the permanent boom towns to get under way in the Okanogan County was Tonasket, named after the famous upper valley Indian, Chief Tonasket. 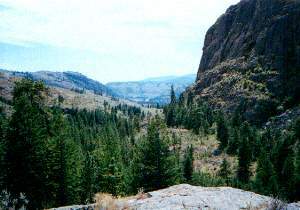 In 1888 W.W. Parry, opened a trading post on the west side of the Okanogan River about six miles south of present day Tonasket. There, Parry built a store, saloon, hotel with 10 rooms, blacksmith shop, and a barn large enough for 16 horses and hay storage. On December 7, 1895 Parry opened a post office and named it Tonasket. At the future location of the town, across the river, the government in 1892 had opened a boarding school for children on Chief Tonasket's land. Located below the falls in Bonaparte Creek, this school operated until it burned in 1896. 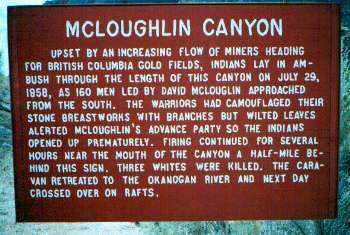 The Okanogan Indians were hostile during the late 1850s. The most dramatic happening along the Caribou Trail occurred on or about July 28, 1858. Not known for sure, but it is speculated that Chief Moses, Chief Tonasket, and Chief Sarsarpkin directed the proceedings. The Indians did not want the whites moving through their territory any more. They ambushed a party of miners northward bound under the command of David McLouglin. In the tense battle four miners were killed. 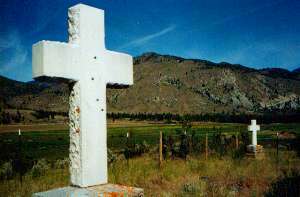 This was the first and only time warfare between whites and Indians spilled into the Okanogan County. This canyon bears McLouglin's name today. Looking south, down McLoughlin Canyon in the direction the attack took place. Okanogan River in the distance. 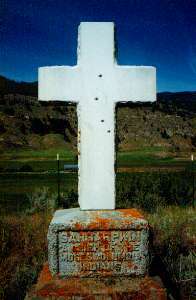 Burial site of Sarsarpkin, A Chief of the Moses Columbia Indians. Tonasket was named after Chief Tonasket, a fearless, able and honest Indian who obtained the confidence of all, Indians and whites alike. After the Indian school moved to Omak there was no school in the Tonasket vicinity. The nearest schools were up in Horse Springs Coulee, where Fred Beeman now lives and one near Whitestone Lake on the land now owned by W.G. Hallauer. The town of Tonasket was plotted between Siwash and Bonaparte Creeks by Clay Fruit, Arthur Lund, Charles Blackwell, T.C. Dodge and Frank Farnsworth. Tonasket had no school and no school district so a subscription school was started. People were coming into the valley and into the town and those with children of school age and others donated money to hire a teacher. Pheasants, Mayberrys, Boones, Foleys, Metcalfs, Dobbins, Kellogs, Websters and Perrys all had children that attended the first school. The first teacher at this subscription school was Mable Francher, who came from Washington State College to file on a homestead in Horse Spring Coulee. Dave Mayberry, a freighter who came down from Canada, filed on a homestead where the upper Tonasket reservoir is now located. He built one of the first houses in Tonasket and the first school was held at his home.